Neil Thin has been Scotland’s best M50 in the last two British and Irish CC Internationals. In Glasgow 2011 he was squeezed into the bronze medal position, only six seconds behind the winner. In Belfast 2012 he fought very hard to finish a close fifth. Back in the 1980s Neil ran for Edinburgh Southern Harriers, was in their winning team in the 1985 National CC and won two team silver medals in the Six-Stage Relay. In the 1985 Edinburgh to Glasgow Road Relay, ESH finished 43 seconds behind ‘The Kangaroos’, guests fielding athletes from the USA and Wales. Hopefully Neil and his team-mates received the gold medals! Never had a coach, and would have run anyway, but my interest in serious training was originally inspired by the sheer brilliance of Graham Williamson in 1978 (I came in more than half a minute behind him in Scottish Schools 1500m), and then by clubmates like Allister Hutton and John Robson which whom I used to run in the E to G, and in the European Clubs Cross-Country Championships in Portugal in 1985. Enjoyed sessions in The Meadows, Edinburgh, with Martin Craven et al. After a ten-year lay-off, inspired to return to running in late 40s by seeing that Brian Kirkwood was still running fast in his 50s. Mainly the intrinsic joy of getting out for a run at lunchtime, and the occasional glee of racing at speeds not too much slower than I used to run in my 20s. Apart from the obvious benefits to health and mental wellbeing and the intrinsic enjoyment, there are two advantages that I think distance running has over just about any other sport: 1. A very clear relationship between effort and performance; 2.the possibility for just about anybody to take it up and pursue it to an excellent standard in most environments, with minimal cost or disruption to anyone else’s life. Most other sports require expensive infrastructure, complicated equipment, time-consuming training, and many require individuals to be supported by family and friends. 30.20 in the Edinburgh 10k road race in about 1984; more recently, 32.06 in 2008 Stirling 10k. 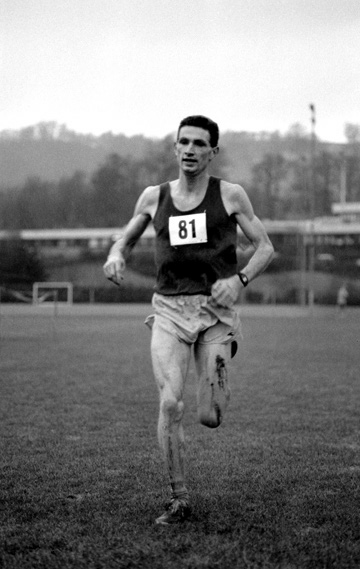 Had some enjoyable wins: twice won the Oxford-Cambridge cross-country as an undergraduate in 1981 and 1982; won the BUPA Great Winter Run (5k round Arthur’s Seat, admittedly when most decent runners were warming up for the international races) at the age of 48 in 2009. Some reasonable track performances: 14.35 for 5000 at Crystal Palace in 1982; 8m27 for 3000 same year; 30.45 approx for 10,000 got me a silver medal at British Universities in Birmingham around 1985. Dropping out of National CC with a stitch in 1984. Wish I had gone under 30 minutes for 10k. Very keen to set Scottish age-group bests at various distances, though I don’t know if records exist. Walking and various casual sports with the kids – football, tennis. Pure relaxation and rehabilitation every day. Plus guilt-free eating and drinking. When not injured (less than 50% of the time nowadays) I try to do up to 70 miles per week, of which 2 days per week would include some long reps or hills. Normally, however, 40miles per week mainly moderate running.